‘I recently changed my career from having my own business in retail to return to my love of care as a support worker. 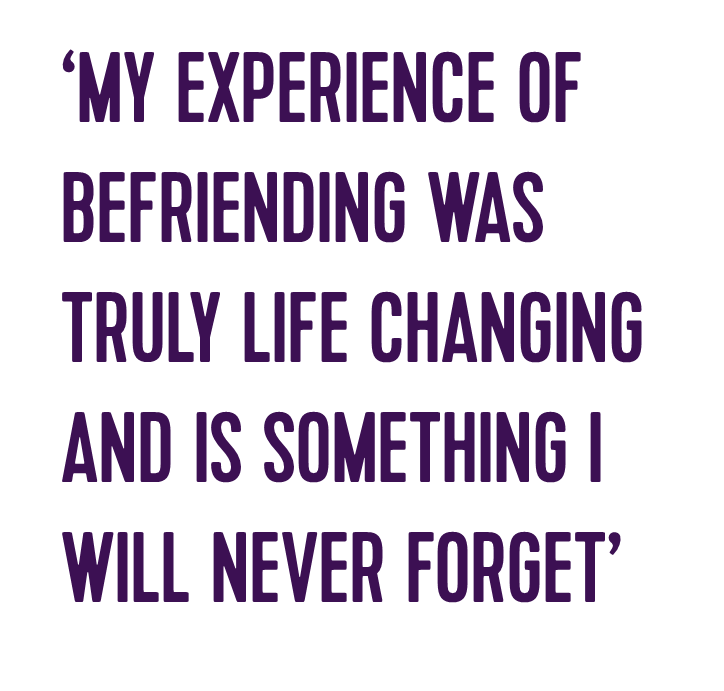 I contacted Volunteering Matters as I had frequently thought about befriending, so I decided to stop thinking and go for it. I was anxious about the training process, as learning through the means of a classroom setting reminded me of school and really wasn’t for me. The project staff were so supportive and highly encouraging, I really can’t thank them enough, and I must say their hard work meant I was paired with a young person who was my perfect match. When I first met my young person, we just clicked. I met with him once per fortnight. Our activities included football, boxing, going to the cinema and finally the trampoline park which was his all-time favourite. Every outing wouldn’t have been complete without his amazing rap lessons whilst in the car travelling home from his activities .My young person never failed to make me laugh every time. My young person had suffered bereavement and therefore found it difficult to find a way in which he could express his feelings, in some circumstances this could potentially come across as challenging, This meant that he was in frequent trouble at school, involving his teachers and class mates. I would have never have though that giving a young person such a small amount of time would have impacted him in such a positive way. After our first few outings I realised that giving praise, reassurance and just simply listening, was making such a difference to his social skills and confidence. This boost in confidence meant he found it easier to interact with other kids. Seeing him spending time and having fun with other young people was amazing. The befriending of my young person was extended to 18 months, which gave us more time spent with each other which we could enjoy, in this time we tried more activities, I was given more fabulous rap lessons, but most importantly had even more fun.